High sample rate device for generation of high frequency waveforms below 50 MHz. , fastest Pragmatic sampling AWG at 100 MS/s. This general purpose arbitrary waveform generator features great performance for standard or custom waveform generation at a very competitive price. 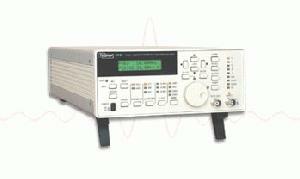 As a function generator, the 2416A provides 9 standard waveforms with numerous parameters. As an AWG, it features 99 waveform storage capability in up to 64k of waveform memory. Three user selectable output filters provide additonal signal conditioning for an optimized output signal. National Instruments LabView driver is available for Windows and Macintosh operating systems. GPIB interface comes standard with each unit. Waveform creation software is available, along with a wide variety of other options and accessories. high sample rate, precise-signal applications.